Foshan Dexinzhai Bundled Trotter was first created in the last years of the Qing Dynasty. It has unique points in material selecting, making, seasoning and cooking. There are two kinds of making processes. One is to boil a whole trotter slowly with condiments, and the other is to skin the trotter, take out the tendons and bones, fill in and bundle fat and lean meat inside the skin, and then boil it. Bundled Trotter can be eaten hot or cold. Because of its good taste, fat but not oily, Foshanese like eating the food. Of all the Bundled Trotter makers, Dexinzhai’s Buddle Trotters taste best and are the most authentic, which becomes more and more popular. 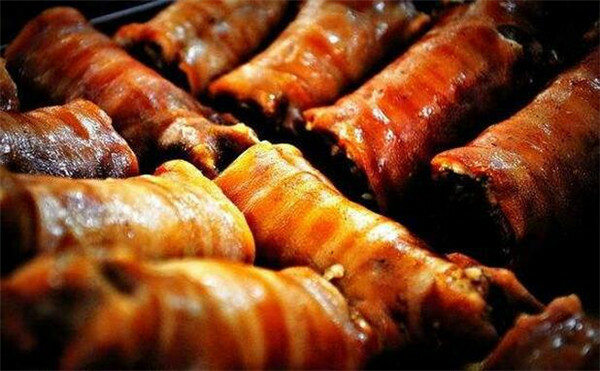 After a hundred years of public praise, Dexinzhai Bundled Trotters have established good reputation both home and abroad , and are sold well in Guangdong, Hong Kong and Macao.